From Forest to Facade: Read our latest blog featuring the journey of Western Red Cedar from the forests of Canada to your project. • Western red cedar grows in the Pacific coastal forests of North America, in this particular case British Columbia in Canada, all forests are sustainable so for every tree felled at least two replacements are replanted. • Trees are professionally selected for harvesting so that they are the right size. • Once felled the log is stacked in the forest for collection, then transported by road or water to the primary sawmill in British Columbia. • At the sawmill the logs are assessed and graded into batches depending on their particular use and buyer. They are then debarked and go through the mill where they are sawn into rough sawn planks (this is the product that we receive in the UK). The mills are automated to ensure that the maximum number of planks are cut from a log. • Any by-products during this process will be re-cycled into other timber related products. • The planks are then stacked into packs, sheeted and banded before they start their long journey to the UK. Each pack will have its own unique reference and bar code. • The pack will then be taken by road to the Port of Vancouver for shipping, or in some instances taken by rail to one of the ports on the Great Lakes, again for shipping. • From Vancouver the shipment will travel by sea down the west coast of America and through the Panama Canal into the Atlantic. Shipments from the Great Lakes will travel to the eastern seaboard and then into the Atlantic. • After crossing the Atlantic the ship will dock, usually at Liverpool, and the packs will be unloaded and custom cleared. They are then ready to be delivered to Bennetts Timber. • Our pack will arrive at our sawmill in Grimsby by lorry, it will be off-loaded, checked and stacked in the mill yard prior to secondary processing into cladding. A sales order will have been raised for the size and specifications of the cladding required by the customer. • When a machining slot is available the pack will be taken into the mill and un-sheeted so that the individual planks can now be handled. • Depending on the profile required, the Weinig moulding machine is set up accordingly. The moulder has 6 heads so can cut and plane a variety of patterns in one pass. Each plank is fed into the moulder and then trailed out and stacked, quality checked, labelled and re-banded. At this stage the product is completely different to the rough plank which first arrived at Bennetts Timber, it is now a board rather than a plank! • If the cladding is to be treated or painted it then transfers to the paint shop, where the paint or treatment is applied via a vacuum coater in accordance with manufacturer’s instructions. The boards are then stacked on cradles for drying. Once fully dry the boards are quality checked, re-stacked , banded, labelled and sheeted. • The cladding order is now ready for despatch to site. Depending on location transport will either be via our own delivery vehicles, or through a national carrier as we deliver all over the UK. • The pack is then unloaded on site and should be un-sheeted and un-banded. If not being used immediately the cedar boards should be stored in a cool and dry place. • The individual cladding boards are then fixed onto the building using stainless steel nails or screws in accordance with the fixing pattern and system chosen by the architect, building surveyor or builder. 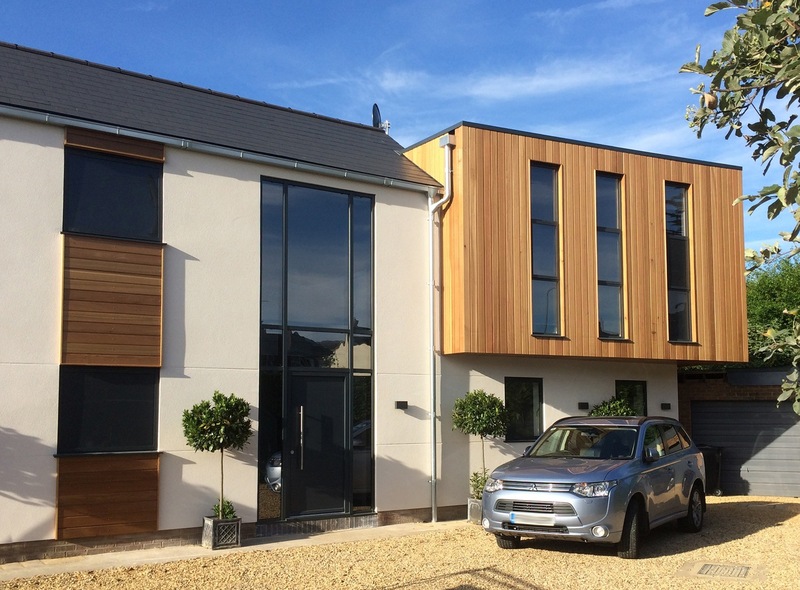 As you can see the journey from Forest to Facade is a long one, both in terms of distance and time, at least you now know how this hugely versatile, durable and attractive timber, Western Red Cedar gets to you.